The East Zion Tourism Council or their information suppliers expressly disclaim liability for errors and omissions in the contents of this web site. No warranty of any kind, implied, expressed or statutory, including but not limited to the warranties of non-infringement of third party rights, title, merchantability, fitness for a particular purpose and freedom from computer virus, is given with respect to the contents of this web site or its hyperlinks to other Internet resources. We encourage anyone traveling to research plans extensively from many sources before they commence their vacations. All public and commercial information, itineraries, tour packages and offers found on this site are the sole property of the suppliers who offer the services and as such they are responsible for the accuracy of the content and delivery of their products or services. The East Zion Tourism Council or their information suppliers take no responsibility for the accuracy or quality of any public information or updates found here-in as these travel plan resources are gathered from local, state and federal offices, and where permission is obtained, from private sources. Furthermore, the East Zion Tourism Council or their information suppliers cannot be held liable for any direct, incidental, or consequential damages or adversities which may result due to travel information or resources listed here or for problems which may arise in the course of any individual or group's travel. You are responsible for your own safety and survival. This guide is to be used as an aid and only to be used at your own risk. The very nature of outdoor recreation has a potential hazard. Use good judgment, do not take kids where they should not go, and be prepared. Use good decision making skills. You are responsible for your own safety. Hiking the off-trail routes in this guide: Many of the hikes in this guide are "off the beaten path" or non-classic trails. These are not trails, but rather a way to get to a certain destination. Many of these places involve climbing, swimming, use of technical skills or other manner of locomotion. We encourage all that plan to use these routes to research their routes through before attempting them. Heed all cautions when hiking. Check weather conditions, wear appropriate attire and bring plenty of water on hikes. Many of the routes in this guide lead to places where rescue might be impossible. Be aware that weather, flash flooding and other condition may change trails, hikes and routes. Hiking in extreme weather, either hot or cold can make a simple hike dangerous. 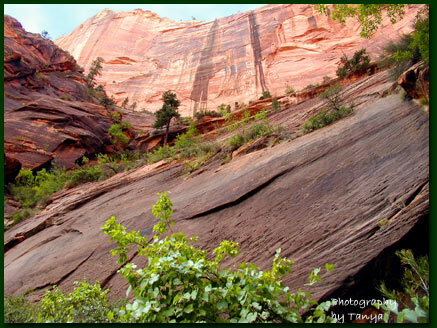 Information presented on this web site is copyright protected and may be distributed or copied only with the express written permission of the East Zion Tourism Council. Private vehicles can travel SR-9, from Zion's south entrance, out the east entrance (or visa versa) to the junction of SR-9 & US-89 year-round, 24 hours a day. See tunnel restrictions for Oversized Vehicles. Summer, Spring and Fall, the only access to the Scenic Zion Canyon Drive is via Zion's shuttle, but during the winter private vehicles can travel in the canyon. Exact dates the shuttle runs may vary. No personal information is collected, but routine data is recorded that tells the site owner how many people visit each page. Nothing in this process identifies an individual and there is no attempt to identify any visitors to this site.